It looks like Ben Hollingsworth is moving on. According to The Hollywood Reporter, the Code Black star has joined a new movie with Smallville alum Laura Vandervoort. Hollingsworth played Dr. Mario Savetti on Code Black, which just wrapped its third and final season on CBS. The cast also included Marcia Gay Harden, Luis Guzmán, Rob Lowe, Boris Kodjoe, and Harry Ford. Alongside Smallville star Laura Vandervoort, Hollingsworth will star in an upcoming remake of the 1977 David Cronenberg film Rabid. The remake comes from filmmakers Jen and Sylvia Soska and is currently shooting in Canada. What do you think? Did you watch Code Black? Will you watch Hollingsworth in Rabid? More about: CBS TV shows: canceled or renewed?, Code Black, Code Black: canceled or renewed? Code Black: Should the CBS TV Show Have Been Cancelled? 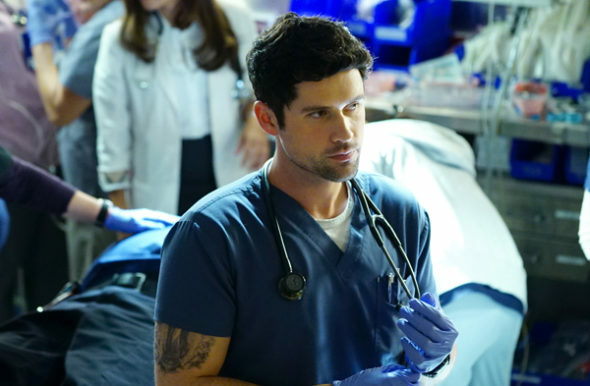 Code Black: How Will Season Two Handle the Cast Changes? I always looked forward to watching Code Black, one of this best TV programs but I agree with one of the other comments you leave crap programs on for years and have failed comedies one after the other; but the good programs always go off the air. Who in the world makes these decisions! No I don’t like scary movies. But liked him in Code Black. I’m really upset code black is ending. It was a great show and yet you have crap shows that stay on for years. A lot of disappointed people over this. I’ve thoroughly enjoyed all the episodes of Code Black. It’s really upsetting to hear it is being cancelled. I hope that decision will be reconsidered. Good viewing is getting harder and harder to find anymore. Code Black is a wonderful slow. Have enjoyed every episode. So well done. Fight for reversal of the cancellation. I liked Code Black. CBS is ignorant when it comes to knowing what a good show that tv viewers like is. No. Cannot stand sci-fy. If CBS has anything to do with shows I definitely will not watch it! Code Black was an intelligent show with very talented people! Writers were awesome too. This show and Scorpion, excellent. Better than 99% of the crap currently on or coming on. CBS continues their unintelligent programming. Come on somebody! Pick up this show! You’d have all kinds of fans flocking to your network! I completely agree! Code Black is a great show with good acting and writing. It’s so far above most of the other network garbage out there. I hope Netflix picks it up. Still holding out and hoping some network will be savvy enough to pick up Code Black and give it the run it deserves! I really don’t want it to go away. Amen!! I just don’t understand why networks can’t put out Quality television! Loved code black . . .gonna miss it . . . Wish there were more shows like it on TV. Code Black was one of the best medical dramas on TV. Can not believe it got cancelled. Move it to a new time slot, new time in the season, or whatever you need to do but Please Bring It Back!!! Bring back Code Black and put it in the Saturday night lineup. Keep Code Black and Scorpion. Get rid of Living Biblically, Me,Myself and I, and the new Magnum PI. I wholeheartedly agree with you on keeping Scorpion as well as Code Black. Two incredibly terrific shows!